The interior of Kabah, is relatively simpler as compared to the rest of the mosque complex. Most recently the interior of the Ka'bah was renovated in 1996 CE. The wall directly opposite to the entrance of the Kaaba has six tablets inlaid with inscriptions, and there are two more tablets along the wall adjacent to the entrance. Three pillars (some erroneously report two) stand inside the Kaaba, with a small altar or table set between one and the other two. (It has been claimed that this table is used for the placement of perfumes or other items.) The interior walls, measuring 13 m (43 ft) by 9 m (30 ft), are clad with tiled, white marble halfway to the roof, with darker trimmings along the floor. 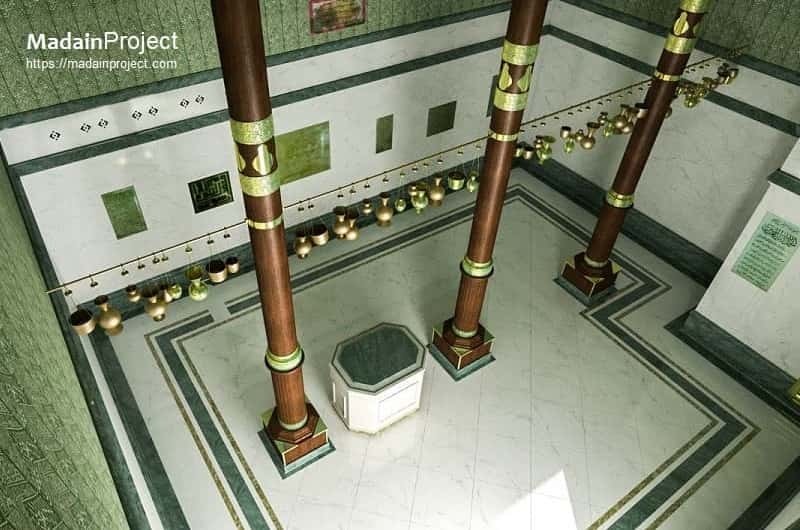 An almost accurate 3D reconstruction of Kabah's interior. The main entrance (golden door) directly in the background, some of the older lamps hanging and the door to the stairs to the extreme left. Lamp-like objects (possible lanterns or crucible censers) hang from the ceiling. 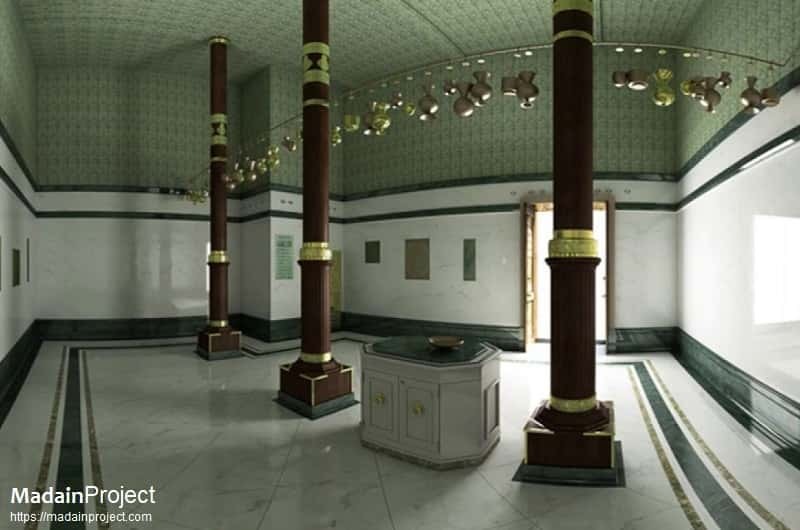 Along the top corners of the walls runs a green cloth embroidered with gold Qur'anic verses. Caretakers anoint the marble cladding with the same scented oil used to anoint the Black Stone outside. Panoramic view of the Ka'aba interior from the south-west corner, also called the Rukn e Yamani (the Yemenite corner). The ceiling itself is of a darker colour, similar in hue to the lower trimming. A golden door—the bāb al-tawbah (behind the middle pillar, also romanized as Baabut Taubah, and meaning "Door of Repentance")— right of the entrance, opens to an enclosed staircase that leads to a hatch, which itself opens to the roof. One of these pillars dating back to the time of Abdullah ibn al-Zubayr, circa 670 CE, is preserved in Two Holy Mosques' Exhibition in Mecca. Model of the the Kaaba, from the Mecca Museum. This modal is somewhat accurate and depicts the double-roof of the Kabah (the double roof has crawl space between the lower and upper roof), the three pillars inside, the raised marble platform, the entrance to the right, the Bab al-Taubah in the left corner as well, along the other features. In contrast to the red brics shown here, Kabah was built with black volcanic rock abundant in the surroundings of Mecca, more recently it was reconstructed with granite.